The other day I cut H. influenzae chromosomal DNA with XhoI and separately with EcoRI. I inactivated the enzymes with heat (65°C for 20 minutes) and then incubated the DNAs with Klenow polymerase, dA, dG and dC, and biotin-tagged dU. Both of the restriction enzymes generate sticky ends with 5' overhangs that are 4 nucleotides long and include a dA, so the Klenow should have filled these ends in, incorporation the biotinylated dU to pair with the dA. Anyway, the photo above shows that this worked. The top (1) and bottom (6) lanes are size standards. 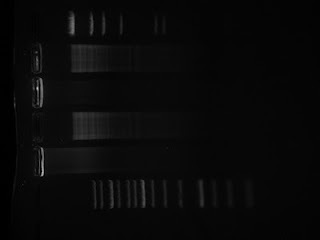 Lanes 3 and 5 are beads (1.2 µ ad 2.1 µ respectively) mixed with EcoRI-cut DNA that wasn't biotinylated. Lanes 2 and 4 are the same beads mixed with the biotinylated DNAs. You can see that a lot of the biotinylated DNA stayed in the well, just as it should. I don't know why the rest of the biotinylated DNA is smeared. So tomorrow I'll get back to making the cells competent and persuading them to stick to a coverslip. Note added later: I just did the math, to calculate how many beads and how many DNA fragments I mixed together. There would have been about 10^8 beads (fewer of the 2.1 µ and more of the 1.2 µ) and about 1 µg of DNA. EcoRI cuts H. influenzae DNA to an average fragment size of 6 kb, so 1 µg is about 2 x 10^11 DNA fragments. Thus the mix I loaded on the gels had about 2000 DNA fragments per bead. If about 10% of the DNA stayed in the wells with the beads, that's about 200 DNA fragments per bead, which should be plenty for the preliminary uptake experiments.